The Hannabach Classical Exclusive line combines our admired traditional craftsmanship with high-tech materials and technology. The basses are made with a new material which has fantastic qualities in its elongation which in turn creates the right tension for quick and perfect tuning, unrivaled sound brilliance and crisp and easy tones together with an outstanding durability. The wire is made with a much higher silver content to ensure a long lasting perfect playing feeling. I am a long time user of Hannabach strings and I decided to try the Exclusive line a few months ago. 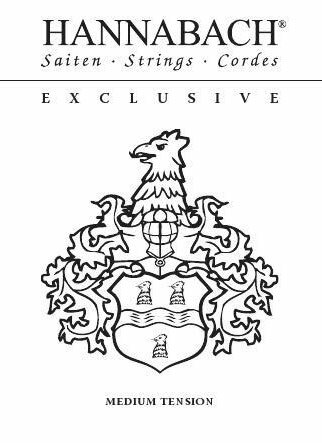 These are excellent strings. The sound characteristics and quality are outstanding, especially the base strings. My instrument is a 1996 Kenny Hill which is the traditional Torres style guitar (single top and fan bracing) with spruce top and maple back and sides. The base strings add noticeably to the response of the guitar. The trebles are round an full and complement the maple tone wood of the instrument. I have used both the high tension and medium tension and my preference is the medium tension which provides a better vibrato control in my experience.